In the Military Records Burnt in Fire? Try Morning Reports dated 10 December 2009, I explained that Morning Reports could be used to gather ancestry data when the Military Service Records were lost in the 1973 fire. However, I also suggest due to the time and cost investment needed to peruse these microfilm reels which have not been indexed, you may wish to gather all other resources first. One such resource is the last pay stub often held in the veteran’s personal folder. For most veterans these have been saved; perhaps they were not held in the same repository as the fire. Although this last pay stub may be one lone sheet of paper with scribbles and numbers, a keen eye may uncover a few ancestral hints. 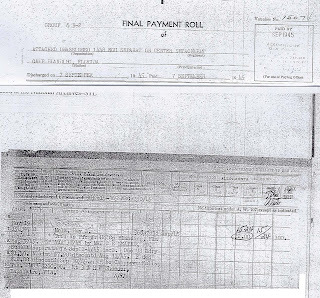 For one, the discharged date, along with the specific regiment and where the veteran was stationed at time of discharge is provided on this last pay stub. It also provides the rank/class, i.e. Private First Class. If the service/serial number was not known prior, the last pay (if complete) for the veteran may also hold that number, making it easier to distinguish your ancestor from other veterans with the same common name. Along with discharge information, the veteran’s enlistment date and rank may also be listed. As transfers often generated a payment, they may also be itemized payments on the allotment sheet. This is one step closer to creating a scratchy service map of your military ancestor. Even though this all seems quite meager, it will assist you later when scouring military repositories and resources. It may even assist in lessening the time and cost investment needed to locate additional information within the Morning Reports.